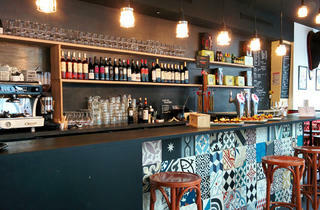 Discover Spanish charcuterie, sangria and wines at this tantalising tapas bar. This friendly, bodega-style bar draws in passers-by with a tantalising display of hams (chorizo, paleta iberica and other lomos) hanging in grand bay windows. Head inside, and you’re greeted by a large bull’s head wedged in the wall and the fragrant smell of tapas wafting over from the counter. All around you, jolly diners wash down their food with large glasses of wine at high bistro-style tables, while others drink out on the pavement. 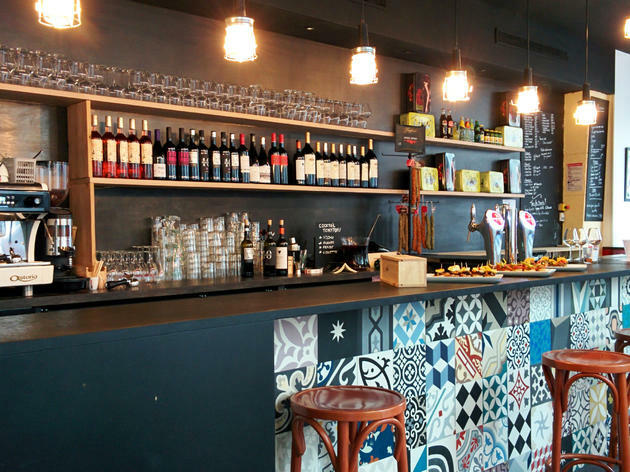 From the menu, begin with a cheese board or a selection of Spanish charcuterie, both top quality and generously sized though ambitiously priced (think between €20 and €40). Alternatively, opt for ten tapas for €25 or a portion of octopus carpaccio or stuffed piquillo peppers at roughly €10 each. If you’re here at lunch, make the most of the small bistro menu, which offers eight specialities like ham risotto and garlic-flavoured cod for around €15. Team your food with one of 20 Spanish wines (€25-€50 a bottle and €5 a glass) or a refreshing sangria, but don’t go for their rather tasteless draught beer. There are a couple of drawbacks here: the service is incredibly slow (perhaps exceptionally during summer time) and the noise of traffic on Rue Saint-Martin can impinge on conversations if you're on the terrace. Still, if you’re not in a rush, the food will make it worth your while.